But hopefully our by-product is just as easy to spread. Recently, a friend with dyslexia needed to challenge a government decision and she really struggled. Neither she nor her support person had found the information she needed to go to the right place to get it solved. And she's not alone – many people struggle to find out where to go when they're unhappy with a decision made by a government department, local council, or some other government agency. 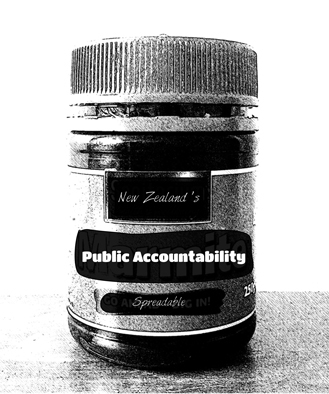 This accountability "stuff" matters because our public sector serves the public and should be easy to use. But what's that got to do with by-products that turn out to be their own little jar of goodness? When we started our public accountability project last year, we looked for a list of the organisations people could go to when they need to hold a government agency to account. We couldn't find a source that held all this information, so we created one. While this list was essential input for the project, we realised that it might also be useful to other people – especially the public and community organisations that support people to get the help they need. That's our by-product. We now have a list of 93 different organisations and officials, and we found more information about 51 of those organisations and officials. They can hear complaints, review decisions, or conduct inquiries. OK, so a "list" doesn’t sound like an exciting by-product. You're right, it’s not. But we hope that, with the right technical expertise, this list can become a valuable tool in connecting people to accountability and complaints services far more easily and quickly. One of the big challenges for such a list is keeping it up to date and having it in a user-friendly format. We know we’re not best placed to do that. After talking with some government and non-government organisations, the Govt.nz team at the Department of Internal Affairs agreed to pick up this list and use it to improve www.govt.nz. This website is an all-of-government site that aims to make it easier for people to understand and find government agencies. On 14 October 2015, we took another step in spreading this work by introducing some interested agencies to the Govt.nz team. We hope that this will put the team in touch with some of the right people, and help them figure out how best to use and present the information we pulled together. If you’d like to be involved, email us: online@dia.govt.nz.